Because that’s the way you’ll get it. 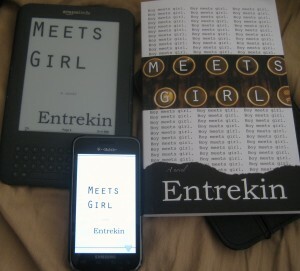 I’ve spent the past week coding Meets Girl for Kindle. I’d originally considered making it a Kindle exclusive. Given that publishing for Kindle doesn’t actually restrict one to the device because Amazon’s app is available on pretty much every platform (PC, Mac, Android, iOS, etc. ), I thought just going with Kindle was easiest for everyone. But I’m rethinking that. Because I started thinking, wait. What if I were a reader who’d bought a nook because I liked Barnes & Noble? In terms of digital distribution, exclusivity doesn’t make a whole hell of a lot of sense. Plus, Barnes & Noble’s Pubit platform went live last week. And you know the first thing I did when I got that particular email was sign up for a publisher account. I’m not going to promise ubiquity to start with, but I am going to make as much available as I can as soon as I can. Meets Girl will go live on Lulu and Kindle on November 29th. I will begin serializing it four weeks before, on November 1st. I haven’t yet decided how much I’m going to ultimately post. I think the first nine or ten chapters, which will basically carry through into 2011. Like, oh, I don’t know, maybe a contest? Meets Girl: Sometimes the Greatest Love of All Is Unrequited.